Cosmic 24 Karat Catnip Filled Cat Toy is filled with 100% North American grown catnip. Cosmic Catnip has been grown to achieve the strongest, most aromatic catnip ever produced. 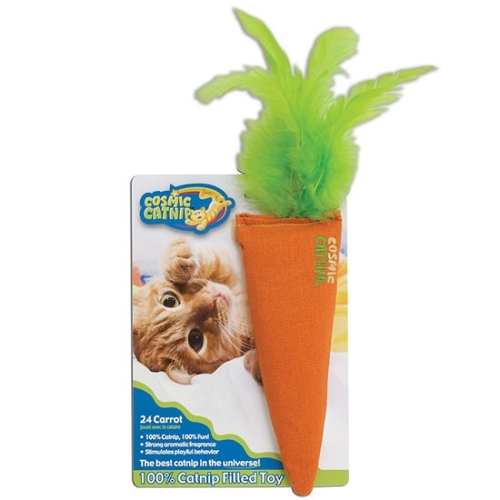 The action of a cat playing with this catnip-stuffed toy will release the energizing aroma for long-lasting play. Cosmic 100% Catnip Filled Toy is so packed with catnip that your cat won't be able to resist it. Highly recommended. I have 3 cats and bought 3 -- glad they each have one. They love them! My cats all LOVE this toy! I originally purchased this toy at my local grocery but when they ran out I had to find it somewhere else. PetGuys is so quick and convenient. I give this Apeel pet toy and PetGuys my highest evaluation. I am so happy that I bought this toy. So happy, in fact, I went back the next day and bought 3 more! Another one for my house and 2 for my neighbors' cats. The catnip is so strong my cats chewed and slobbered and loved on the cardboard package as if it were another toy. ProsCats love 'em. 2 toys for the price of one....if your cats like the cardboard packaging as much as mine did. Affordable through PETGUYS.com. ConsPETSMART sells this toy for 6.99. My cats had a short but dramatic argument over this toy. Our cats love these fresh, fragrant catnip toys. The fabric is soft yet durable for months of use. I have three cats. The Cosmic Banana is, without a doubt, their favorite toy. The shape is user-friendly, and the catnip is strong enough to make them very happy. The material is tough enough to withstand tough love. This cat toy was purchased for a shelter cat in Florida. The shipment was right on time, and the package was labeled specifically for Sonny the office cat. So it didn't go astray and lost. Very pleased with the purchase. Will buy more items as needed. Thanx for great job! ProsWell priced toy that was delivered within the time factors. Sonny really enjoys the catnip filled banana, and it's built well to last a longer time. My cat LOVES his pepper!!! He likes catnip in all forms, but nothing comes close to his pepper. He adores this thing! My cats thought this was the best thing ever. I've since bought 3 more, since I have 7 cats. Best catnip toy ever!